Will Amiibo Have A Curtain Call In 2018? — GamingWithSwag.com - Dads By Day, Gamers By Night. The "Toys To Life" craze has seemingly died off, as both manufacturers and retailers have slowed production and distribution considerably within the past year. As I made my way through garage sales this past summer, both Disney Infinity and Skylanders were loaded onto tables by parents hoping to recoup at least a buck or two of their hard earned money for fad that went as seemingly fast as it came into the spotlight. Last year, Lego announced that it's foray into the Toys to Life game, Lego Dimensions would be seen to completion this past Fall. Retailer GameStop even stopped taking all Toys To Life figures back in trade about a year or so ago. Amiibo however had initially shown no signs of stopping in 2017. Several different series were released such as The Legend of Zelda: Breath of the Wild, Super Mario Odyssey, and others. With over 150 figures released worldwide at an average of $12.99 a figure, Amiibo collecting is nothing to sneeze at. Nintendo even teamed up with Kellogg's to create the newly released Super Mario Cereal which featured a box that had an NFC chip to act like an Amiibo figure was present when held up to the Joy-con controller in Super Mario Odyssey. This allowed extra bonuses to be present in the game as an extra thank-you for trying the berry scented cat foo-I mean cereal. 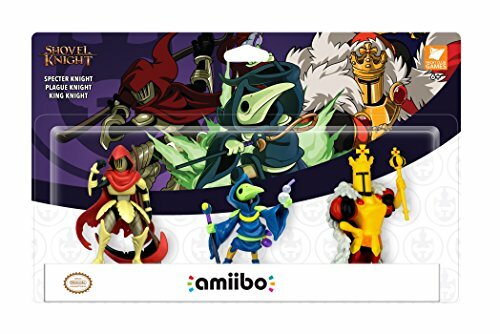 So far only three Amiibo figures from the Shovel Knight series have been announced for release in 2018. Conveniently, these will be released all together in another three-pack for $34.99 in early 2018. The Amiibo that were released last year like Super Mario Odyssey and Metroid all coincided with a major release. These would populate store shelves for the first few weeks of release, then vanish as quick as they arrived. Store shelves are currently sold out of most popular characters, especially in the Super Mario series. Most stores in my area have a few Legend of Zelda: Breath of the Wild Amiibo, and leftover Animal Crossing figures from way back in 2016. But what else is on the horizon for Amiibo? Nintendo has been pretty tight-lipped when it comes to the NFC chipped characters future, but I think they will squeak out another series or two. Especially if they have a few heavy hitter titles like the new Metroid Prime launch this year. The next Nintendo Direct this January will dictate the future of Amiibo, but all signs are pointing to the end of a product line later this year. I personally would be very surprised to see any Amiibo figures released in 2019, but you never know the big N could surprise us. For now, keep an eye out for more Amiibo related announcements and preorder when you can as supplies like the Super Mario Odyssey and Metroid series are still very limited.